Great Borne is a familiar sight in West Cumbria, dominating the northern side of the entrance to Ennerdale, and appearing as a sudden start to the high ground of the Lake District. At just over 600m it does loom over the lower fells to its north-west, and it presents its impressive western ridge and the crags and screes of Herdus Scaw to view. Great Borne is actually only the name of the summit area. 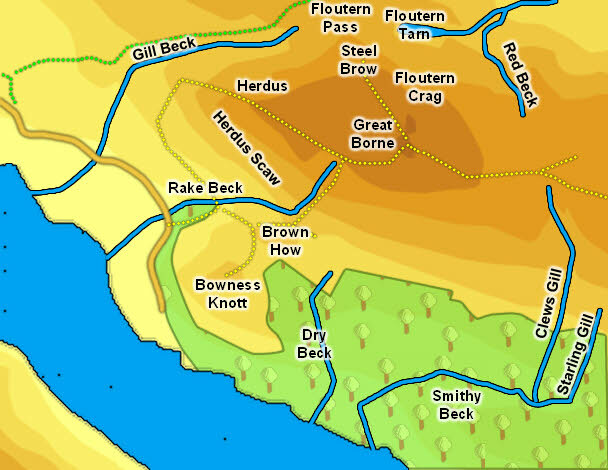 The bulk of the fell is correctly (if infrequently) called Herdus, with Herdus Scaw as the western front. Great Borne is a rare example of a fell that really only belongs to one valley - although it can be approached from Loweswater and Buttermere the route is long and very wet, and the fell isn't visible from those valleys. It very much stands at the end of a ridge, with the only high link to other fells being the eastern ridge towards Starling Dodd, Red Pike, High Stile and High Crag. Large parts of Great Borne are really too steep for practical ascent. The main path up follows the western ridge, and is reached from a small parking area where Rake Beck crosses the road. The fell can also be climbed up Steel Brow, or along the easy ridge route leading to Starling Dodd. A more obscure and difficult route follows the path up to the col between Brown How and Great Borne, then climbs up alongside Brown How. This involves some scrambling on rock, and a good head for heights (I've talked to people who use this route). It is also possible to climb up the rock field to the east of crags by the beck - I've used this route, which is acceptable if a bit steep towards the top. To avoid the most difficult climb continue east above the tree line towards Clews Gill, and ascend the easier slopes or follow the line of the gill, then turn left to reach the summit. We currently have no walks on Great Borne. Great Borne has a large plateau above the steep sides, with the summit sitting on top of a small rise in the middle of the plateau. The summit itself is a mix of rock and grass, and is a rather pleasant place to sit and enjoy the impressive views, with the sea to the west and Ennerdale and Buttermere to the east. The eastern border of the fell is marked by Red Gill in the north and Clews Gill in the south, which both flow from the dip between Great Borne and Starling Dodd. Clews Gill then flows into Smithy Beck, which runs west between Great Borne and Latterbarrow, before turning south to enter Ennerdale Water. Gill beck forms the northern and western border of the fell, rising just below Steel Brow and flowing west before turning south to flow past Routen Farm down into Ennerdale Water. Rake Beck is born on the southern slopes of the fell and flows south before turning west to act as the boundary with Brown How and Bowness Knott. A little further east Dry Beck runs through Bowness Plantation, the western end of the Ennerdale forests. Floutern Tarn sits below Floutern Crag almost due north of the summit of Great Borne. This tarn is rarely seen, and isn't in sight from the summit of the fell. On the slopes above the Brown How col there is a stone fox trap - a well built structure that appears to have been designed to act as an animal trap. This can be found on the path up Rake Beck.